Information workers in your organization handle many kinds of sensitive information during a typical day. Document Fingerprinting makes it easier for you to protect this information by identifying standard forms that are used throughout your organization. This topic describes the concepts behind Document Fingerprinting. If you’d like to learn how to create a document fingerprint, see Protect form data with document fingerprinting. Ideally, your organization already has an established business practice of using certain forms to transmit sensitive information. After you upload an empty form to be converted to a document fingerprint and set up a corresponding policy, the DLP agent will detect any documents in outbound mail that match that fingerprint. You’ve probably already guessed that documents don’t have actual fingerprints, but the name helps explain the feature. In the same way that a person’s fingerprints have unique patterns, documents have unique word patterns. When you upload a file, the DLP agent identifies the unique word pattern in the document, creates a document fingerprint based on that pattern, and uses that document fingerprint to detect outbound documents containing the same pattern. That’s why uploading a form or template creates the most effective type of document fingerprint. Everyone who fills out a form uses the same original set of words and then adds his or her own words to the document. As long as the outbound document isn’t password protected and contains all the text from the original form, the DLP agent can determine if the document matches the document fingerprint. 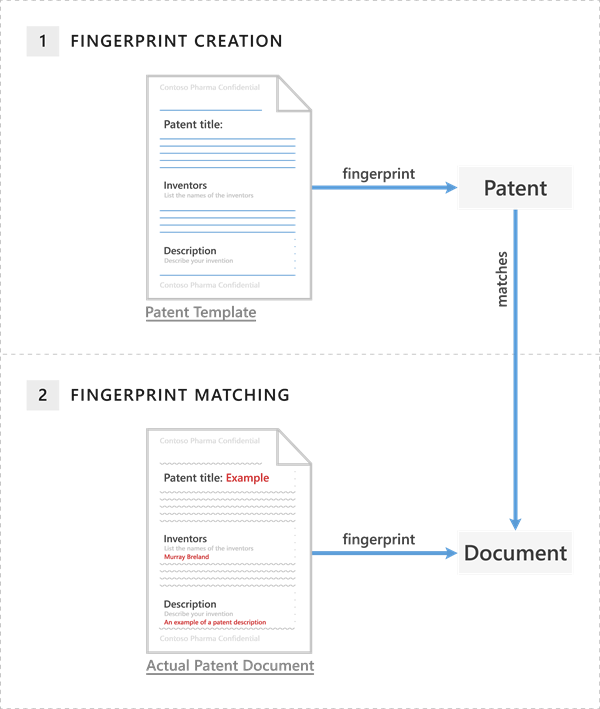 The following example shows what happens if you create a document fingerprint based on a patent template, but you can use any form as a basis for creating a document fingerprint. The patent template contains the blank fields “Patent title,” “Inventors,” and “Description” and descriptions for each of those fields—that’s the word pattern. When you upload the original patent template, it’s in one of the supported file types and in plain text. The DLP agent uses an algorithm to convert this word pattern into a document fingerprint, which is a small Unicode XML file containing a unique hash value representing the original text, and the fingerprint is saved as a data classification in Active Directory. (As a security measure, the original document itself isn’t stored on the service; only the hash value is stored, and the original document can’t be reconstructed from the hash value.) The patent fingerprint then becomes a sensitive information type that you can associate with a DLP policy. After you associate the fingerprint with a DLP policy, the DLP agent detects any outbound emails containing documents that match the patent fingerprint and deals with them according to your organization’s policy. For example, you might want to set up a DLP policy that prevents regular employees from sending outgoing messages containing patents. The DLP agent will use the patent fingerprint to detect patents and block those emails. Alternatively, you might want to let your legal department to be able to send patents to other organizations because it has a business need for doing so. You can allow specific departments to send sensitive information by creating exceptions for those departments in your DLP policy, or you can allow them to override a policy tip with a business justification. For more detailed information about creating DLP policy rules and exceptions, see DLP procedures, and to learn more about setting up policy tips that users can override, see Manage policy tips. Document Fingerprinting supports the same file types that are supported in transport rules. For a list of supported file types, see Use mail flow rules to inspect message attachments in Office 365. One quick note about file types: neither transport rules nor Document Fingerprinting supports the .dotx file type, which can be confusing because that’s a template file in Word. When you see the word “template” in this and other Document Fingerprinting topics, it refers to a document that you have established as a standard form, not the template file type.